Planning a trip interstate or overseas with your bike? Been 'umming' and 'ahing' as to how to package your bike for the plane trip? Too many proprietary bike cases to choose from or don't want the expense of another piece of kit to store that is rarely used? Well here's a simple solution to save you money and give you great flexibility. With luggage allowances relatively stringent these days what you need is a bike container that has minimal weight to give you maximum weight capacity for your bike and personal stuff. A simple cardboard bike box will do this. There are a range of bike cases on the market varying in price from around AU$100 to over AU$1000 – some flexible and some hard case options. But another reality of a purchased bike case is the need to store it between trips. Some fold but others are just plain bulky to store. Rather than purchase a dedicated bike carry case, a simpler least costly option is to call into a bike shop and pick up a bike box. New bikes normally come in one of these and, once the proprietor has unpacked and assembled a new bike for a customer, he/she has no further use for it. Most bike shop owners are happy to get rid of them and will give you one for free. Standard cardboard bike boxes are normally 200mm wide x 1200mm high x 1500mm long. When you pick up a bike box from a bike shop, also ask for a plastic front fork separator and a plastic rear derailleur protector. These are throwaway items that come with a new bike. When packing your bike you'll need to remove the front wheel so the plastic front fork separator will ensure the protection of the front forks when it rests on the floor of the bike box. The plastic rear derailleur protector provides a spacer between the rear derailleur and the inside wall of the bike box. If you travel on your own you normally need a pull along bag you can take with you as cabin baggage as well as your bike (that has to go into checked baggage). The main drawback here is moving the fully laden bike box between the car, the train and the airport check-in when you've only got two hands - one hand to pull your carry on and the other to lug your bulky bike box. It's very difficult to lug a bike box with other than two hands and especially awkward when the bike box is fully laden. 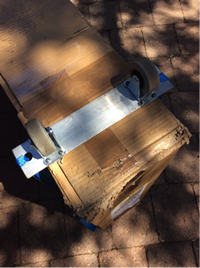 By adding a pair of fixed direction wheels to the rear of a bike box the awkwardness dissipates because you can then either push the laden box or pull it along. Also, as you now only have to bear one end of the bike box, the weight is halved as the wheels transfer the other half of the weight directly to the ground. Using Uncle Bob's Bike Box Wheels you simply remove them from the bike box at the check in counter and store them in your carry on bag. By the time you pack your bike in a bike box and add other bits like basic tools, spare tubes and a tyre, water bottle, helmet, bike shoes, bike clothes and toiletries you will be up to somewhere between 15 and 20kgs - very close the maximum weight allowance of 20kgs for many domestic and overseas flights. A weight allowance of 10kgs for your carry on should see you through for leisure clothes and, if you run out of space in your carry on, an over shoulder small back pack is an option for the extra bits that, most likely, won't be challenged. Another option for a bike box is to purchase one from the airline you intend to travel with. These are normally around 300mm wide instead of 200mm wide and hence a lot bulkier. The materials required to make Uncle Bob's Bike Box Wheels are all readily purchased from a Bunning's Hardware Warehouse and consist of a strip of aluminium to make an axle, 2 fixed direction furniture wheels, 8 small nuts and bolts (or pop rivets) to secure the wheels to the axle and a tension strap. 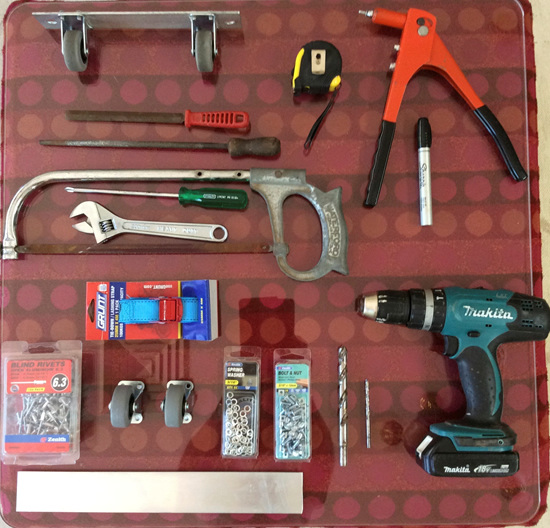 The tools you'll need include a tape measure, a marker pen, a hack saw to cut the aluminium axle to length, an electric drill with a 12mm and a 5.5mm drill bit, a fine toothed round metal file, a fine toothed flat metal file, a pop riveter or small shifting spanner and screw driver and ideally, a vice or clamping device to hold the aluminium axle while you saw and drill it. Unfortunately you can't buy short lengths of aluminium from Bunning's so unless you intend to make more than one set bike box wheels, you'll end up with a long length aluminium offcut once you cut the length you need for the axle. Axle: 1 - 3mm thick x 50mm wide x 260mm long piece of aluminium (if a 200mm wide bike box) or 2 - 360mm long (if a 300mm wide bike box) - cut from a 50mm x 3mm x 3000mm aluminium flat ('Metal Mate Alu Flat 5108'or equivalent). Doubling up on the axle strip for a 300mm wide bike box will significantly reduce flexure when the tension strap is tightened. Nuts and Bolts: For single axle thickness use 8 – 4.8mm (3/16 inch) dia x 12mm long mushroom head slotted Phillips Drive nuts and bolts with 8 - 4.8mm (3/16 inch) spring washers. Or if you'd prefer to use rivets, use 8 – open aluminium 6.3 blind rivets (4.8mm dia and 4.8mm grip). If the wheels are for a 300mm bike box and a double thickness axle is adopted, increase the length of the bolts or rivets you purchase by at least 3mm. 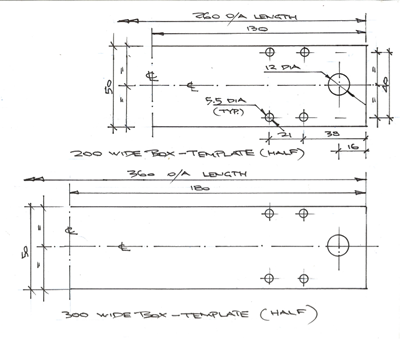 The cutting and drilling layout of the aluminium axle for both a 200mm wide bike box and 300mm wide bike box is set out in the diagram below. Cut the axle to length while clamping it, mark out the holes to be drilled with a marking pen, drill the 12 diameter tension strap holes in each end, preferably position the wheels and drill through the wheel screw holes with the 5.5mm drill bit into the aluminium axle. File the burrs from the cut and drilled axle using a flat metal file for the ends and a round metal file for the 12mm tension strap holes. Remove your front wheel, including the skewers to the front wheel and store them in a plastic container (eg Chinese take away). Insert the plastic front fork separator into the front fork. Remove the pedals from the crank arms. Make sure to undo the pedals in the correct direction using a 15mm open ended spanner or an appropriate Allan key. The right hand side pedal (sprocket side) has a right hand thread (same as most nuts and bolts) and you need to undo it by turning it anticlockwise. The left hand pedal (non sprocket side) has a left hand thread so you need to undo it by turning it clockwise. Note: a good practice is to smear a bit of grease on the threads of the pedal splines and, when you put them back on, only tighten them up thumb tight. Once you've removed the pedals put them in your plastic container along with your spanner and Allan keys. Remove the handle bar with the appropriate Allan keys and let it dangle by the brake and gear cables. Reattach the front fork steering tube cap to ensure the front fork doesn't drop out the bottom of the head tube. Pack your helmet, bike shoes, plastic container, spare packing tape, spare tyre and tubes and any other bits into the bike box. Don't include any pressure packs or bike lube as these could be challenged by airport security resulting in you having to undo the box at customs to remove them. Put some bubble wrap around loose items to ensure they don't move around in the box. Unpacking the bike box is simply the reverse of packing it. 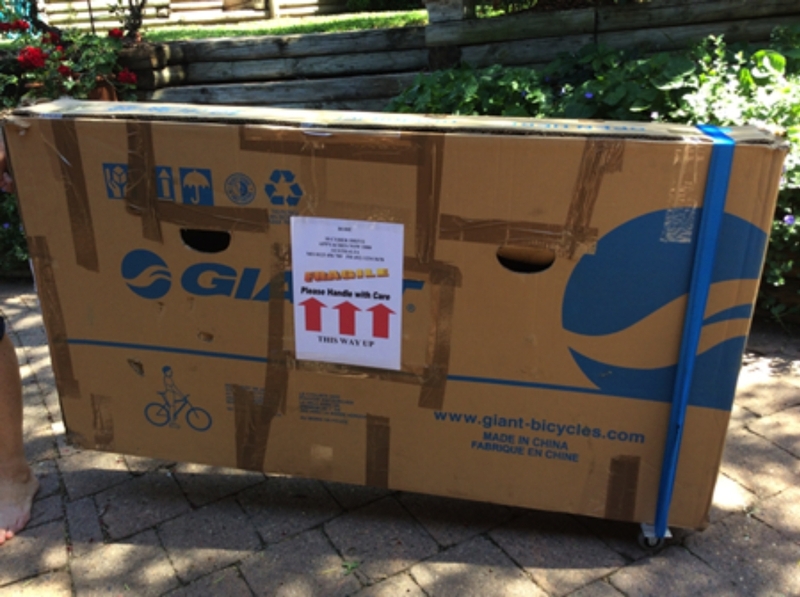 Once the bike and other contents have been packed into the bike box, check to make sure everything you planned to take in the box is included then use packing tape to tape up the flaps and reinforce the cut outs at the sides of the box for handling. It's also a good idea to add a computer printed sign to the side of the box to indicate the contents are fragile and to keep the box the right way up. Insert the bike box through the loop and tension the strap up by pulling it tight around the bike box about 100mm from the end of the box. If the wheels are too far from the end of the bike box and you are a tall person, the end of the bike box will wear as it scrapes along the ground. An upside down view of the tensioned up wheels on the bike box is as shown in Figure 5. 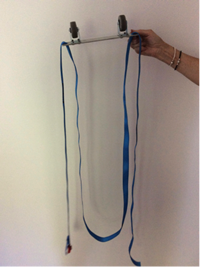 For an investment of around $50, a small amount of time and effort you could add this very handy item to your bike kit. Unfortunately, the main cost is in the length of aluminium flat. However, if you can manage to get an off cut from somewhere or alternatively, spread the cost by making more than one and sharing the cost with others, you will save on your financial outlay. Having tried and tested the wheels on a recent cycling trip to Japan, I know that you will not be disappointed with Uncle Bob's Bike Box Wheels. The author is currently a member of Ku-ring-gai Rotary Club and the Marketing Coordinator for the Bobbin Head Cycle Classic 2015. He is a regular group cyclist and cycles 4 days a week with 3 different groups in Sydney's northern suburbs. 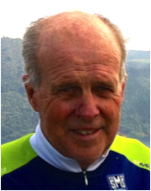 As well as his weekly routine of cycling he has completed numerous intrastate, interstate and overseas social cycling events. He rides essentially for pleasure and fitness.